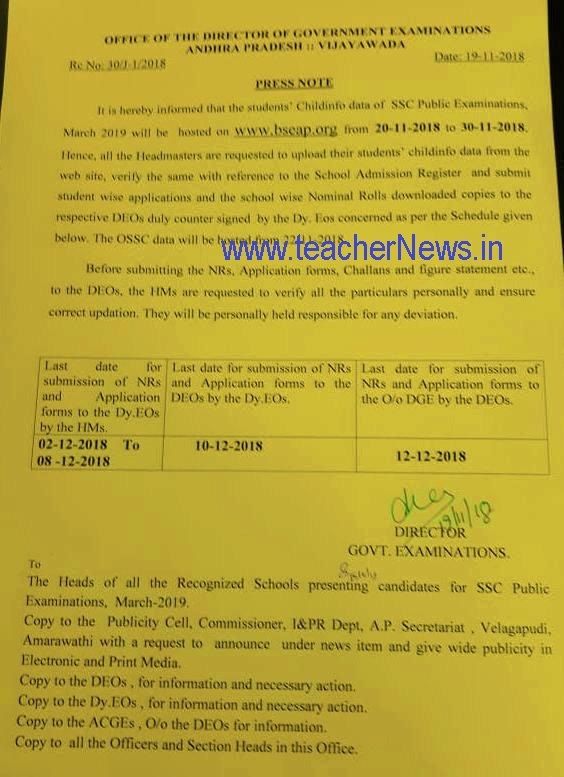 Childinfo data NR Upload of SSC Public Exams, March 2019 Schedule and instructions : AP SSC March 2019 Nominal Roll Online Registration Official link at www.bseap.org. AP SSC 2019 Online Application Form Students Registration link. AP SSC 2019 Students Nominal Rolls Upload link / AP 10th class online application AP SSC 2019 Online Registration process is as follows. It is hereby informed that the students' Childinfo data of SSC Public Examinations, March 2019 will be hosted on www.bseap.org from 20-11-2018 to 30-11-2018.Hence, all the Headmasters are requested to upload their students' childinfo data from the web site, verify the same with reference to the School Admission Register and submit student wise applications and the school wise Nominal Rolls downloaded copies to the respective DEOs duly counter signed by the Dy. Eos concerned as per the Schedule given below. Online Registration, Submission Of AP SSC (10th Class) Regular Students Nominal Rolls (NMRs) March 2018,AP SSC 2018 Nominal Roll Online Registrations @ bse.ap.gov.in. The OSSC data will be hosted from 22-11-2018. Before submitting the NRs, Application forms, Challans and figure statement etc, to the DEOs, the HMs are requested to verify all the particulars personally and ensure correct updating. They will be personally held responsible for any deviation. NR Upload of SSC Public Exams, March 2019 Schedule and instructions download and AP SSC March 2019 Nominal Roll Online Registration Official link at bseap.org.